The BMW S 1000 R is the naked version of the S 1000 RR superbike. The German bikemaker has officially launched the new S 1000 R in 3 trims - Standard, Sport and Pro. The Standard variant retails at Rs 16.9 lakh, the Sport for Rs 17.9 lakh, while the Pro version will cost you Rs 18.9 lakh (all prices ex-showroom, Delhi). The styling of the bike is based on the asymmetric styling of its faired sibling. The asymmetric headlight might take some getting used to, but it does endow the bike with a distinctive face, while the sculpted tank with sharp extensions adds a healthy dose of muscle. It clearly follows a mass-forward design language which is best appreciated in profile. Fit and finish level of the motorcycle is top notch and it comes to India as a CBU (completely built unit) from Germany. Powering the naked bike is the same 999cc in-line four motor as seen on the S 1000 RR but it has been retuned to suit the streetbike characteristics of the motorcycle. Power figure is down from the S 1000 RR's 199PS to 165PS but it is available at a lower 11,000rpm. Torque is up by 1Nm with 114Nm peaking at 9250rpm. The engine is mated to a 6-speed gearbox that delivers power via a chain drive. Electronic rider aids was something that made the S 1000 R stand out from its rivals. The new motorcycle carries the electronic wizardry further and is equipped with Ride-By-Wire and two riding modes - Rain and Road. There are two more optional riding modes on offer - Dynamic and Dynamic Pro. In Dynamic Pro, you can customise each setting according to your preference. Apart from the above, you get cornering ABS, ASC (traction control), launch control, pit lane limiter and cruise control. 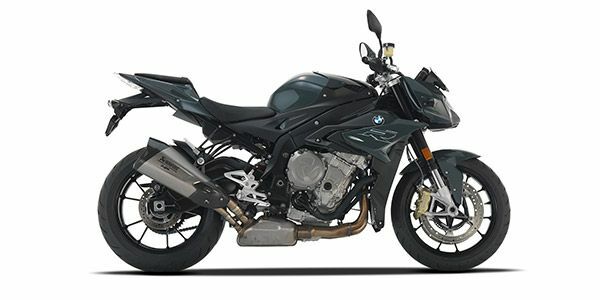 BMW S 1000 R prices start at Rs. 16.70 lakh (Ex-Showroom) and the top end variant BMW S 1000 R Pro is priced at Rs. 18.50 lakh (Ex-Showroom). BMW S 1000 R is available in 3 variants and 3 colours. The claimed ARAI mileage for the BMW S 1000 R petrol is 12 kmpl. The BMW S1000R is the stripped down version of the renowned S1000RR, and is among the best performance naked bike one can buy in the country but at a hefty premium.